This item, written by Kansas City Star editor Charles Cecil Howes, addresses the long history of newspaper publication in Kansas. According to Howes's research, "Jotham Meeker was the first newspaper publisher in Kansas. That is, he brought the first printing press and established a newspaper for the Shawnee Indians." 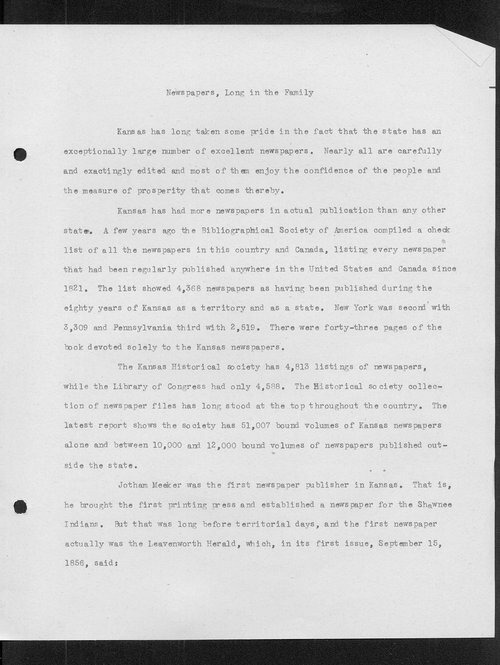 Howes also explains that, at the time he wrote the article, the Kansas State Historical Society had "4,813 listings of newspapers" that were published within the state of Kansas.